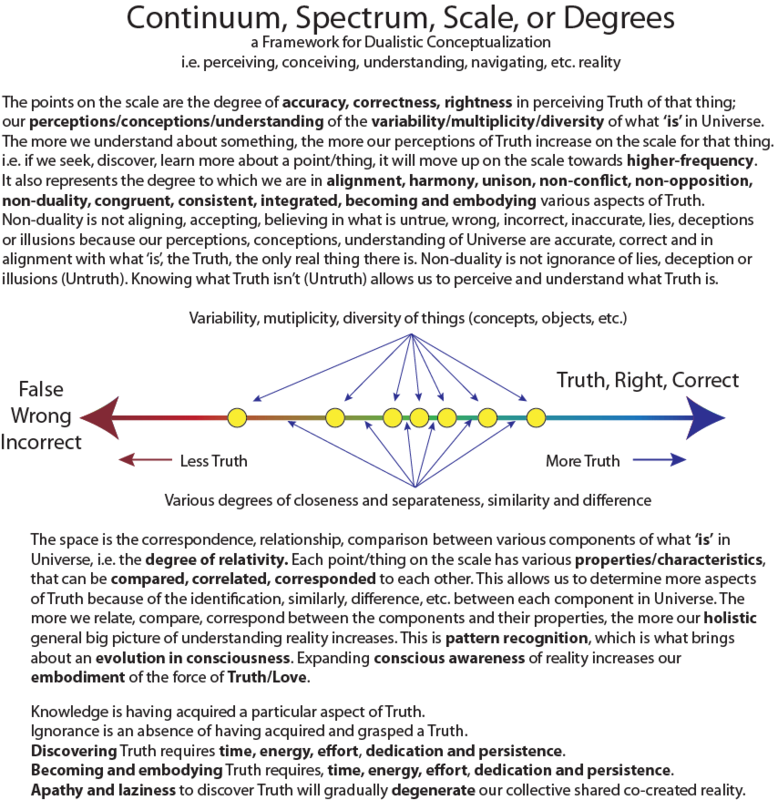 My previous explanation of the continuum, spectrum, scale or degree of relation between aspects of universe or Truth may have been lacking in depth in order to understand how valuable it is to understand things. I will elaborate to give a more complete understanding. Understanding this framework concept helps to understand reality, higher Self, Natural Law, etc. If you already understood the post on Degrees of Relativity and Learned Helplessness, this might help a deeper understanding of the value of this dualistic conceptual framework. A dualistic framework is a polarity. Please read Consciousness and Polarity if you have not already. The images below are too large for the content width, please click on them. 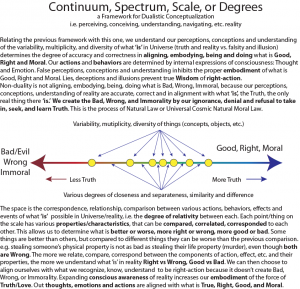 The dualistic conceptual framework is a basic way for understanding reality using a spectrum within which to conceive the various components of reality. There are things in the universe. These things are not the same. There are similarities and differences between the properties and characteristics we can identify. These differences or similarities can be visualized on a line scale, spectrum or continuum according to the properties and characteristics that they each have or don’t have. Many aspects of understanding reality can be applied to this basic framework. Aspects, variability, diversity, multiplicity of Universe/reality are the objects/things on the continuum, spectrum, scale or line. Nothing is the same. Each has various degrees of similarity/difference between each other. We need comparison, correlation and correspondence to be applied between the various properties and characteristics of each component/aspect in Universe/reality. Next we can begin to apply a dynamic to the framework in order to understand it better. We can apply Truth, and the lessening/reduction/negation/refusal of Truth, which is untruth, falsity, lies, deceptions, illusions, etc. 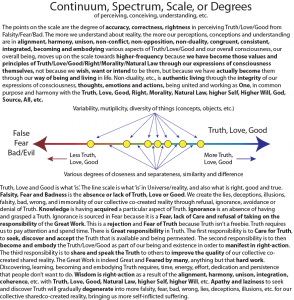 as a dualistic conceptual framework to understand more about how Truth works. Below this explanation is the framework diagram with the text explanation included in the image. If you already understand how Truth, Good, Love, Right, Moral, Correct, Accurate, Best, Optimal are the same thing, then you understand what this post is talking about and don’t really need to keep reading. For those who want to understand it more deeply, or want some clarification, or are just curious, please continue. The points on the scale are the degree of accuracy, correctness, rightness in perceiving Truth of that thing; are perceptions/conceptions/understanding of the variability/multiplicity/diversity of what ‘is’ in Universe. The more we understand about something, the more our perceptions of Truth increase on the scale for that thing. i.e. if we seek, discover and learn more about a point/thing, then it will move up on the scale towards higher-frequency. It also represents the degree to which we are in alignment, harmony, unison, non-conflict, non-opposition, non-duality, congruent, consistent, integrated, becoming and embodying various aspects of Truth. 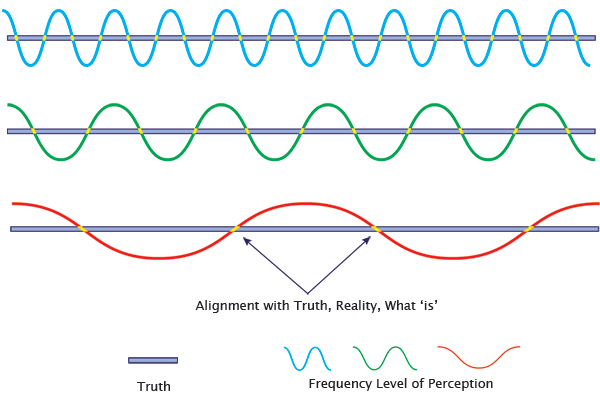 Non-duality is not aligning/accepting/believing in what is untrue, wrong, incorrect, inaccurate, lies, deceptions or illusions because our perceptions/conceptions /understanding of Universe are accurate, correct and in alignment with what ‘is’, the Truth, the only real thing there is. Non-duality is not ignorance of lies, deception or illusions (Untruth). Knowing what Truth isn’t (Untruth) allows us to perceive and understand what Truth is. The space is the correspondence, relationship, comparison between various components of what ‘is’ in Universe, i.e. the degree of relativity. Each point/thing on the scale has various properties and characteristics, that can be compared, correlated, corresponded to each other. This allows us to determine more aspects of Truth because of the identification, similarly, difference, etc. between each component in Universe. The more we relate, compare, correspond between the components and their properties, the more our holistic general big picture of understanding the Universe increases. This is pattern recognition, which is what brings about an evolution in consciousness. Expanding conscious awareness of reality increases our embodiment of the force of Truth/Love. Knowledge is having acquired a particular aspect of Truth. Ignorance is an absence of having acquired and grasped a Truth. Discovering Truth requires time, energy, effort, dedication and persistence. Becoming and embodying Truth requires time, energy, effort, dedication and persistence. Apathy and laziness to discover Truth will gradually degenerate our collective shared co-created reality. We can use the framework to apply other dynamics, such as Good, and the lessening, reduction, negation or refusal of Good, which is Bad, wrong, etc. Below this explanation is the framework diagram with the text explanation included in the image. 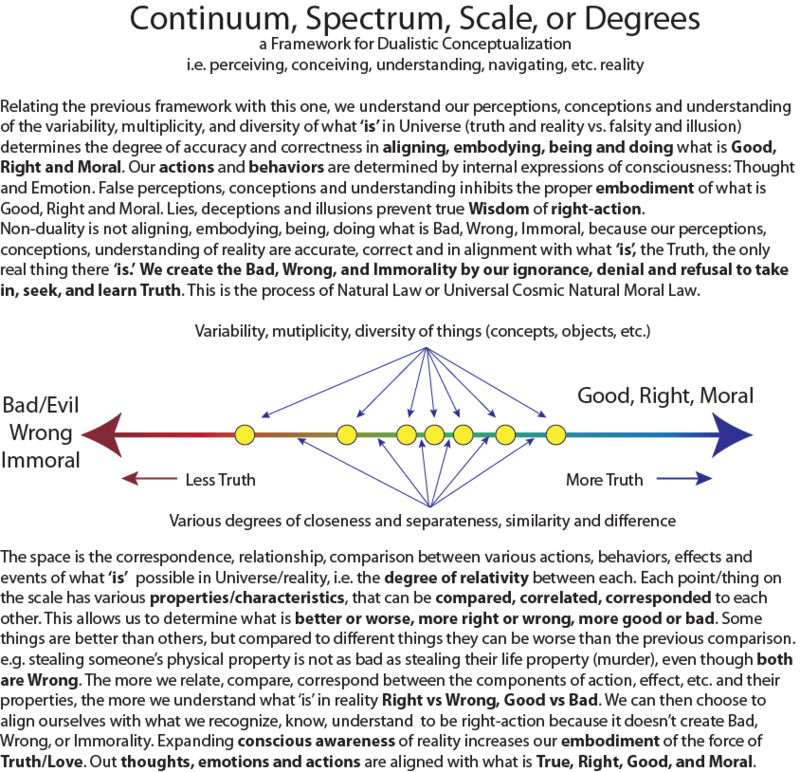 Relating the previous framework with this one, we understand our perceptions, conceptions and understanding of the variability, multiplicity, and diversity of what ‘is’ in Universe (truth and reality vs. falsity and illusion) determines the degree of accuracy and correctness in aligning, embodying, being and doing what is Good, Right and Moral. Our actions and behaviors are determined by internal expressions of consciousness: Thought and Emotion. False perceptions, conceptions and understanding inhibits the proper embodiment of what is Good, Right and Moral. Lies, deceptions and illusions prevent true Wisdom of right-action.Non-duality is not aligning, embodying, being, doing what is Bad, Wrong, Immoral, because our perceptions, conceptions, understanding of reality are accurate, correct and in alignment with what ‘is’, the Truth, the only real thing there ‘is.’ We create the Bad, Wrong, and Immorality by our ignorance, denial and refusal to take in, seek, and learn Truth. This is the process of Natural Law or Universal Cosmic Natural Moral Law. The space is the correspondence, relationship, comparison between various actions, behaviors, effects and events of what ‘is’ possible in Universe/reality, i.e. the degree of relativity between each. Each point/thing on the scale has various properties/characteristics, that can be compared, correlated, corresponded to each other. This allows us to determine what is better or worse, more right or wrong, more good or bad. Some things are better than others, but compared to different things they can be worse than the previous comparison. e.g. stealing someone’s physical property is not as bad as stealing their life property (murder), even though both are Wrong. There are degrees. The more we relate, compare, correspond between the components of action, effect, etc. and their properties, the more we understand what ‘is’ in reality Right vs Wrong, Good vs Bad. We can then choose to align ourselves with what we recognize, know, understand to be right-action because it doesn’t create Bad, Wrong, or Immorality. Expanding conscious awareness of reality increases our embodiment of the force of Truth/Love. Out thoughts, emotions and actions are aligned with what is True, Right, Good, and Moral. We can put everything together in one image to give an overall understanding of how the various dynamics fit together to construct an understanding of reality. The points on the scale are the degree of accuracy, correctness, rightness in perceiving Truth, Love, Good from Falsity, Fear, Bad. 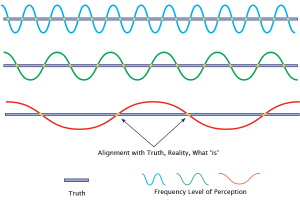 The more we understand about reality, the more our perceptions, conceptions and understanding are in alignment, harmony, unison, non-conflict, non-opposition, non-duality, congruent, consistent, integrated, becoming and embodying various aspects of Truth, Love, Good and our overall consciousness, our overall being, moves up on the scale towards higher-frequency because we have become those values and principles of Truth, Love, Good, Right, Morality, Natural Law through our expressions of consciousness themselves, not because we wish, want or intend to be them, but because we have actually become them through our way of being and living in life. 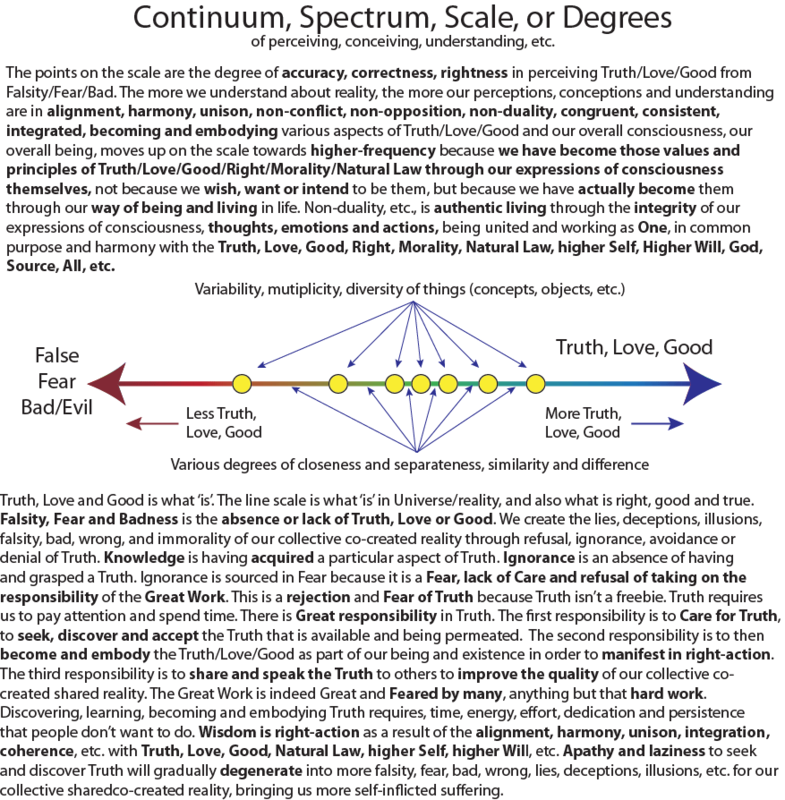 Non-duality, etc., is authentic living through the integrity of our expressions of consciousness, thoughts, emotions and actions, being united and working as One, in common purpose and harmony with the Truth, Love, Good, Right, Morality, Natural Law, higher Self, Higher Will, Spirit, God, Source, All, etc. Truth, Love and Good is what ‘is’. The line scale is what ‘is’ in Universe/reality, and also what is right, good and true. Falsity, Fear and Badness is the absence or lack of Truth, Love or Good. We create the lies, deceptions, illusions, falsity, bad, wrong, and immorality of our collective co-created reality through refusal, ignorance, avoidance or denial of Truth. Knowledge is having acquired a particular aspect of Truth. Ignorance is an absence of having acquired and grasped a Truth. Ignorance is sourced in Fear because it is a Fear, lack of Care and refusal of taking on the responsibility of the Great Work. This is a rejection and Fear of Truth because Truth isn’t a freebie. Truth requires us to pay attention and spend time. There is Great responsibility in Truth. The first responsibility is to Care for Truth, to seek, discover and accept the Truth that is available and being permeated. The second responsibility is to then become and embody the Truth/Love/Good as part of our being and existence in order to manifest in right-action. The third responsibility is to share and speak the Truth to others to improve the quality of our collective co-created shared reality. The Great Work is indeed Great and Feared by many, anything but that hard work. Discovering, learning, becoming and embodying Truth requires, time, energy, effort, dedication and persistence. Wisdom is right-action as a result of the alignment, harmony, unison, integration, coherence, etc. with Truth, Love, Good, Natural Law, higher Self, higher Will, etc. Apathy and laziness to seek and discover Truth will gradually degenerate into more falsity, fear, bad, wrong, lies, deceptions, illusions, etc. for our collective shared co-created reality, bringing us more self-inflicted suffering. In these conceptualized dualistic frameworks there is only one thing. The other component is illusory, it is not really there, but we perceive it as being there so that we have a scale of comparison to reference and relate against in order for us to come to know the real essence of that thing which does exist. This is also how good and evil operate, and also how the emotional polarities of love and fear manifest. Goodness is what ‘is’. Love is what ‘is’. Truth is what ‘is’. We are attached to illusions which manifest as lies, fear and evil or badness. I took the time, effort and energy to seek and learn Truth because I care for Truth, what is right, and good, and I received aspects of understanding thanks to those who put it out before me, just as I am doing now, putting information out for others to access. The Truth acquired not only comes from others, but from the connections, correspondences and pattern recognition your consciousness makes with the more Truth that is obtained. That is why learning is important, we develop deeper understanding as more pieces of the puzzle fit together, having insights, eureka moments, etc. We can share aspects of the Truth in many ways and help each other find more of that which we Care for in common, more Truth, Goodness, Morality, Freedom, Peace, Prosperity, etc. Those of us who Care for the Truth at a deep level, take the time, energy, effort and persistence to seek, discover, and embrace the Truth, and then work to embody it into our being and daily lives until we can live by example and bring the Truth to others, because we do understand, live it and embody it in our core being. At least, that is how I see it. Everything on the site so far deals with things I know because I am embodying aspects of it and understand how it works through experiential knowledge. Compared to the fact that I don’t have experiential knowledge of past events, hidden tech, or other aspects of reality, but we can come to know certain degrees of probable Truth regarding aspects of what has happened or is currently in existence (I’ve never been to Asia but I have met several Asians). Truth is Love. Love is Truth. Truth unites. Lies divide. Embrace the Truth. Care for the Truth.